The Fianna Fáil leader said each person ‘has a personal responsibility as a citizen’ to decide where they stand on the issue. 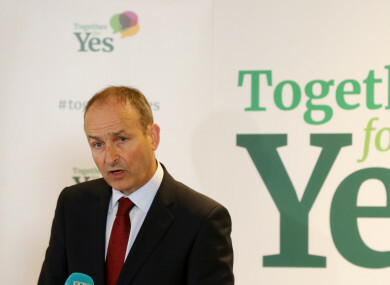 FIANNA FÁIL LEADER Micheál Martin has said the decision-making process of backing a Yes vote in the referendum has been “long and challenging”. Addressing a Lawyers for Yes event in Dublin this evening, he also said he believes the referendum will pass in May. “For a lot of people, including me, coming to a conclusion has been a long and challenging process,” he said. Martin said each person “has a personal responsibility as a citizen to decide” where they stand on the issue. “This doesn’t have to be without reservations, but it does have to involve a frank and honest look at the reality of Ireland today and in the future. “A No vote on the 25th will mean that nothing will change. There will continue to be a long stream of cases through our courts taken by women facing extreme situations and identified only by a letter of the alphabet. “There will continue to be thousands of Irish abortions every year with no engagement with medical professionals. There will continue to be a rising number of unsupervised and unregulated abortions taking place here with the use of abortion pills,” said Martin. He said a No vote will mean that Ireland will continue to be a “cold place for women in the most terrible circumstances”, while a Yes vote will enable a system where the first consultation a woman facing a crisis has is with a medical professional who can support her and outline different choices. “It will enable a system which is regulated, safe and humane. It will bring to an end the failures of the Eighth Amendment,” he said. As a citizen I have made my decision. I will be voting Yes and I will continue to talk about the need for the change which can only be secured by voting Yes. The party leader has faced some backlash within his own party for taking such a view on the referendum, particularly due to party members voting to protect the rights of the unborn at the Ard Fheis last year. Last week, more than half of the Fianna Fáil parliamentary party posed for a photograph to promote a No vote in the forthcoming referendum on the Eighth Amendment. Criticism was levelled at Martin for not being present at a photo-shoot for party members who are for a Yes vote (though TDs have since clarified that the photo was ad hoc, and the absence of the leader had no meaning). With just two weeks out from polling day, Martin called for a civil debate of the issues. “Since I made my personal statement in the Dáil I have visited many parts of the country and have talked to hundreds of people about the referendum. For those who have disagreed with me I have met a very open and respectful tone,” he said. However the most common reaction I have had is from women of all ages telling me of their own experiences and how important it is for them that Irish society hears their voice. The public is becoming very well-informed on the issues, said Martin, though he said it can be difficult. “It can be very difficult to see through a passionate debate – particularly when faceless groups are appearing and spreading dishonest and offensive material. “However I believe that people are intelligent enough to see through this – and I would encourage everyone to focus on the materials provided by reputable and officially registered groups as well as the Referendum Commission,” said Martin. Yesterday, Health Minister Simon Harris condemned, what he called “horrific” posters, which were hung outside his constituency office in Bray. The Fianna Fáil leader said that as the law stands a woman will be forced to carry a pregnancy to term irrespective of the impact on her health, or if she was raped, or if she has received a diagnosis of a fatal foetal abnormality. “It is essential people understand that there is no possible way for this to change if the amendment remains,” said Martin, who said the public must understand that there is no way difficult cases, that often end up before the courts, can be dealt with without removing the Eighth Amendment. It has also been suggested that the limits and regulation proposed in the legislation can’t be trusted and that effectively there will be no limits. This is entirely wrong. We should all remember that five years ago many people claimed that abortion on demand was being introduced because limits in that legislation wouldn’t be respected. Those claims turned out to be false. Martin said he “deeply” understands that many people are “uneasy” about the choice they have to make on 25 May. The party leader urged the public to back the Yes vote. Email “Micheál Martin says making up his mind on abortion has been a 'long and challenging process'”. Feedback on “Micheál Martin says making up his mind on abortion has been a 'long and challenging process'”.